Backed by the vast industry knowledge, we are involved in offering a wide array of Digital Vacuum Wax Injector Machine in the market. 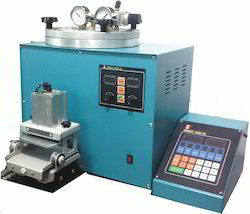 Wax injector is built of heavy duty Aluminium casting chamber for reliability and performance. Features include heater, sealed nozzle thermostat, pressure gauge meter, etc. The unit is equipped with on/off switch, pilot light, air pressure regulator, digital temperature controller, etc. Digital incontrol-vacuum wax injector designed inject consistent, repeatable wax patterns. Draw air out of the mold before inject the wax, eliminating the air bubbles and voids all cause pattern defects and shrinkage increase. Belonging to the Epigonos Endura range, it combines an aggressive design with an essential line, which characterizes and enhances its strength and robustness, in a slender machine with two independent and simultaneous work stations. Fostered with enormous business understanding of this realm, we are involved in presenting a broad consignment of Wax Injector. Wax shrink is a big problem causing considerable metal loss and change of shape when polished. The solution is newly developed two-time injection system that minimizes the wax shrink.